Artistic Tile & Stone was chosen to be the exclusive supplier of Tile & Stone for the Atherton Showhouse. Working with the Owner of the property, special attention was given to preserve the historical aspects of the turn of the 20th century mansion, while still acknowledging that modern conveniences are necessary for the comfort and pleasure of modern day lifestyles. Our Senior Designer, Cynthia Campanile pulled from the talents of several American Craftsmen utilizing hand made tile to instill a feeling worthy of the theme "Heritage House." Traditional materials such as marble mosaic were extensively used, evoking a connection to the ancestral immigrants who were used to build these glorious homes. One of the "Three Sisters' Homes" built for the grand niece of Mark Hopkins, Mrs. Edna Hopkins Taylor Lowery, the 2005 Decorators' Show House sits on land which was originally part of a land grant of 35,240 acres granted to Governor Don Luis Arguello and his wife Soledad Ortega after California's annexation from Mexico. This land grant was divided and sold to numerous wealthy landowners. For many years the land around this residence adjoined the primary estate of the James Flood family who was known as the Silver King of the Comstock Lode. In 1883 E.W. Hopkins bought a large tract of land from the Menlo Park Villa Association, and then in 1902 he purchased an additional 33 acres from John T. Doyle. He envisioned deeding the land to his three daughters "with love and affection" for the building of their marital homes. In 1903 he granted 17.27 acres to his second eldest daughter, Edna. 41 Lowery is part of this tract of land which has been called "Oak Grove Estates" because of its original address, 272 Oak Grove Avenue; "Lowery Acres" because of its owners second married name; and "Kellogg Woods" which is what Edna Hopkins Taylor Lowery called it during all the years she lived there. It seems her grandmother on her mother's side was a Kellogg! 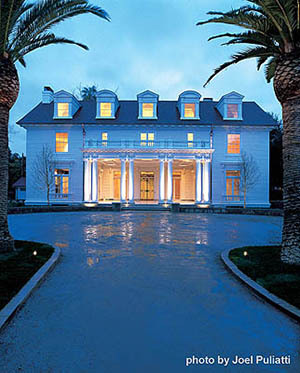 The 2005 Decorators' Show House was designed by one of the most prominent architects of the early 20th century, Bliss & Favrille, whose historical landmark buildings include the St. Francis Hotel, the Flood Mansion (now Sacred Heart Convent), the Bank of California, the Masonic Temple, and many classical buildings of the Panama Pacific International Exposition of which the Palace of Fine Arts remains. Construction began in 1904 on this blend of Greek and Georgian Revival design resulting in a spectacular residence with beautiful architectural details such as Ionic, Doric, and Corinthian columns. The builder of the house was Mr. John McBain who was awarded the contract in February of 1904 to build the structure for $25,000 and, according to the Redwood City Times Gazette, "The beautiful Taylor residence when finished will be the finest and most commodious structure in the county, a credit to the builder . . ." (February 1904). The home was the center of grand lawn parties and society and charitable events for many decades. Most noteworthy, however, would be the wedding of the widowed Mrs. Taylor in 1921 to the widowed Mr. Stewart Samuel Lowery, an officer in a prominent San Francisco bond firm. In 1951, after her two children were married and living in Hillsborough, Mrs. Lowery began dividing up and selling off some of the property. She died in 1956. More lots were sold. The home was modernized in the late 1950's by the designer Ruth Sherman and sold in 1959 to Mr. and Mrs. Gerald Sams who lived there until 1971. It was then sold to Mr. and Mrs. Lee Evans. In January of 2004 it was sold to the present owner's, Richard and Barbara Pivnicka, and Mark Nelson of Atherton Heritage, LLC who make the 2005 Decorators' Show House a reality through their careful restoration.